Adaptable storage features and technology management provide simple utility. 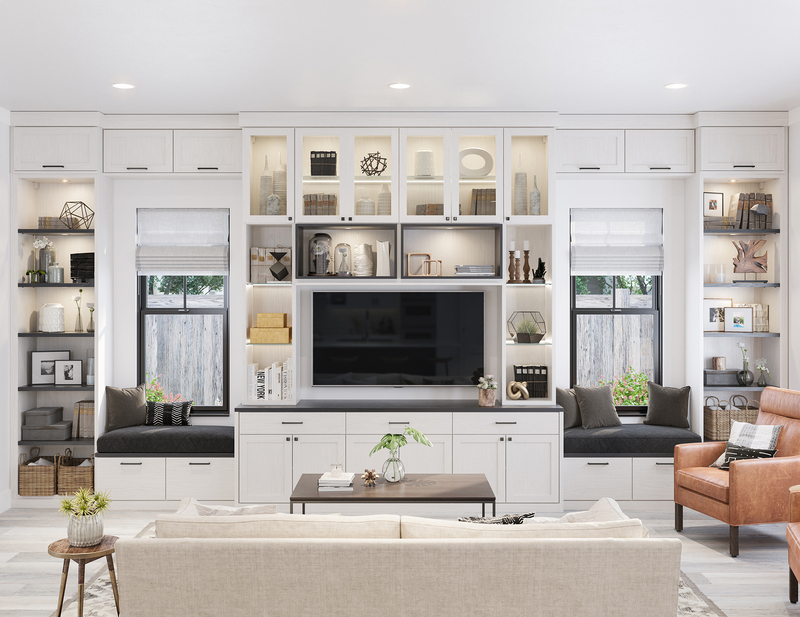 Custom cabinetry, shelving, and lighting offer a look of beautiful furniture—creating harmony with the rest of the home. 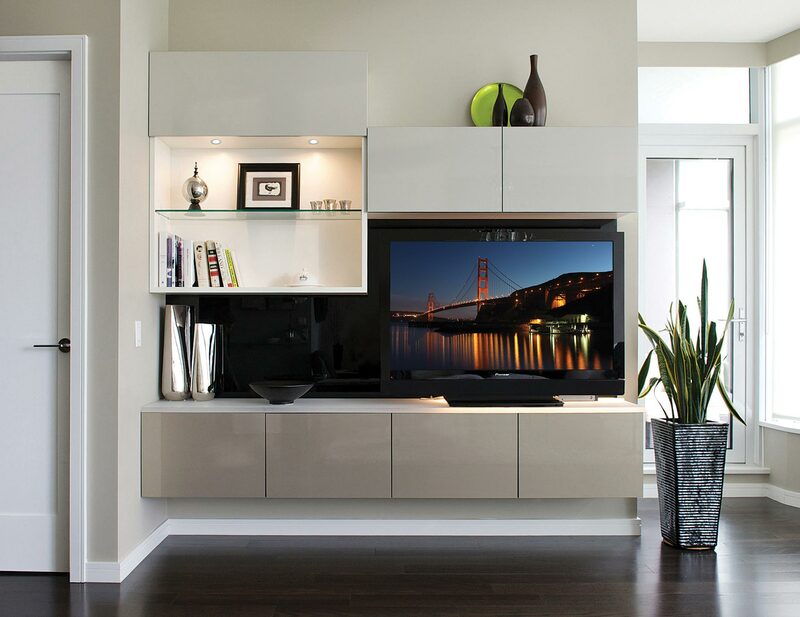 Doors provide a tasteful decorative element on entertainment cabinets, conceal technology, cables, and wires for a clean overall look. 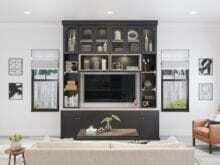 Custom built-in cabinets, as well as decorative moldings and details, create the look and feel of installed furniture. Lighting increases functionality and dramatically enhances the aesthetic of a simple media center design. Media center drawers—offered in a variety of styles—are handy for storing remotes, DVDs, and other items that you want nearby, yet concealed. Our drawers feature dovetail construction, undermount slides, and quiet soft close mechanisms to ensure superior quality and a lifetime of use. 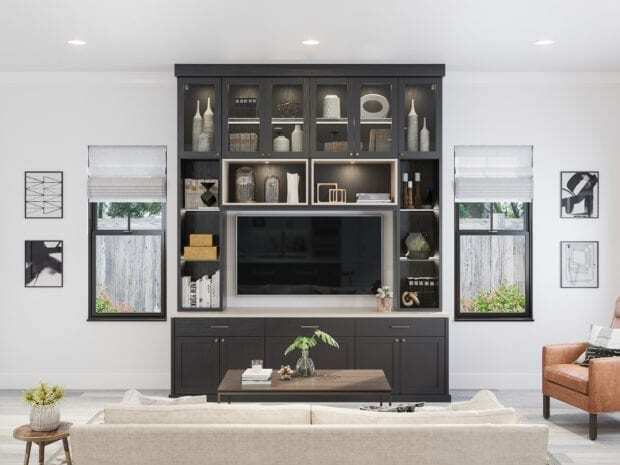 Transitioning effortlessly from a media center to a dining room buffet, this system uses a seamless configuration of open and closed storage, cubbies, floating shelves and X-shaped wine storage. 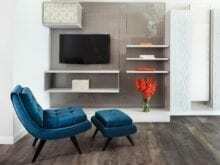 Complementary finishes unite the space yet offer a distinct look to each area. 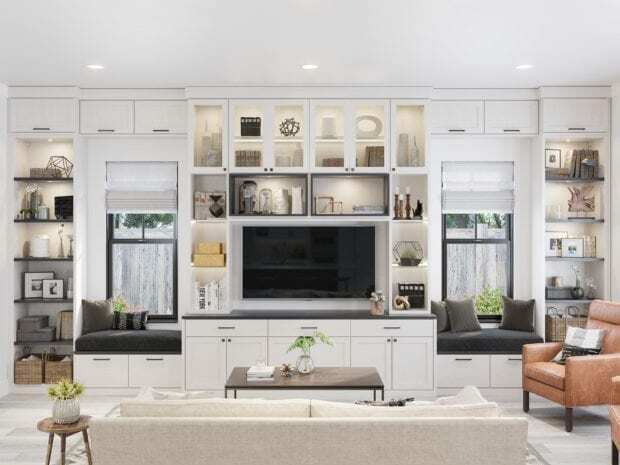 Thoughtfully designed for optimal organization, this media center packs a lot of storage into a compact unit, with plenty of open and closed storage and display cabinets. Wall-to-wall and floor-to-ceiling configurations, along with built-in seating, give this well-designed great room a truly custom feel. 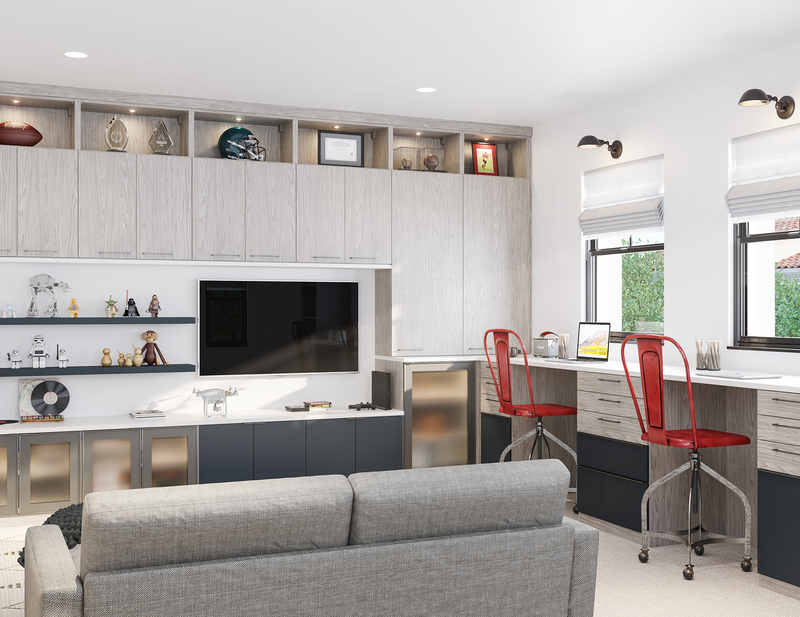 This smartly stylish setup in a mix of neutral hues provides an abundance of open and closed storage to create the ultimate place to study or lounge around. 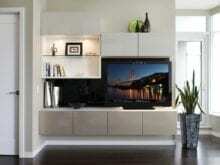 Sliding doors and uplighting create a sleek, modern entertainment center that becomes a home's stylish focal point. 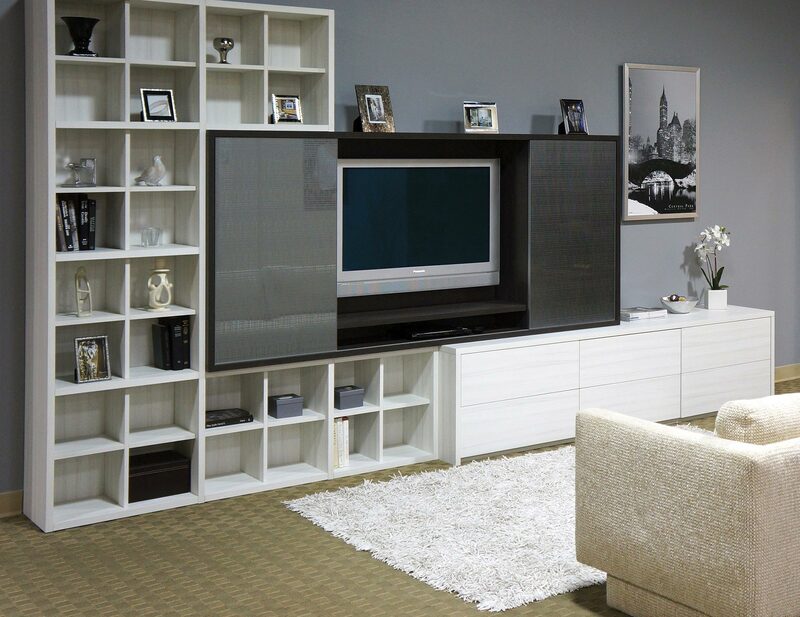 Lower entertainment cabinets in Ebony finish provide a furniture-like feel. 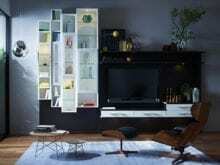 Lit shelf creates a floating look. Up lighting and down lighting illuminate the space. This media center is both functional and understated, making it a tasteful addition to the living space while fulfilling storage needs. Tesoro™ Tuscan Moon finish sets the tone for the monochromatic color palette. High-gloss Wired Mercury back panel creates a sleek look. Deep textured White Wave and Italian glass door fronts in Capodimonte Silver and Micramaya door add artistic accents. Push-to-open hardware on doors and drawers offer ease of use. 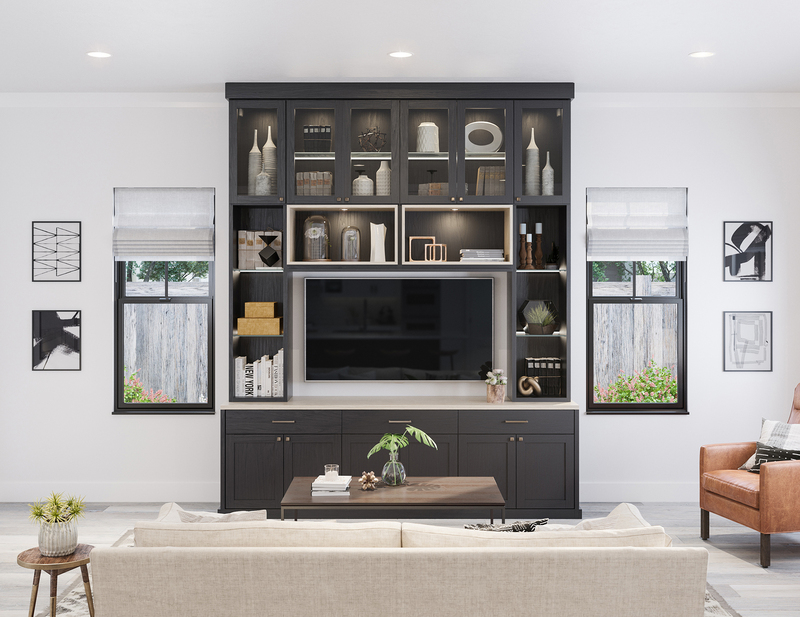 By incorporating LED lighted doors and other modern details, this media center mixes smart design with streamlined storage. Lago® Venetian Wenge and Lago® Bellissima White finish creates a high-contrast color palette. Brushed Aluminum frames with integrated LED color-changing option add splashes of color. 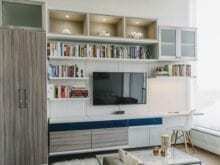 White slab drawer fronts on entertainment cabinets contribute to the sleek aesthetic. LED puck lighting illuminates the space. Lago® Sorrento finish provides a rich, traditional look. 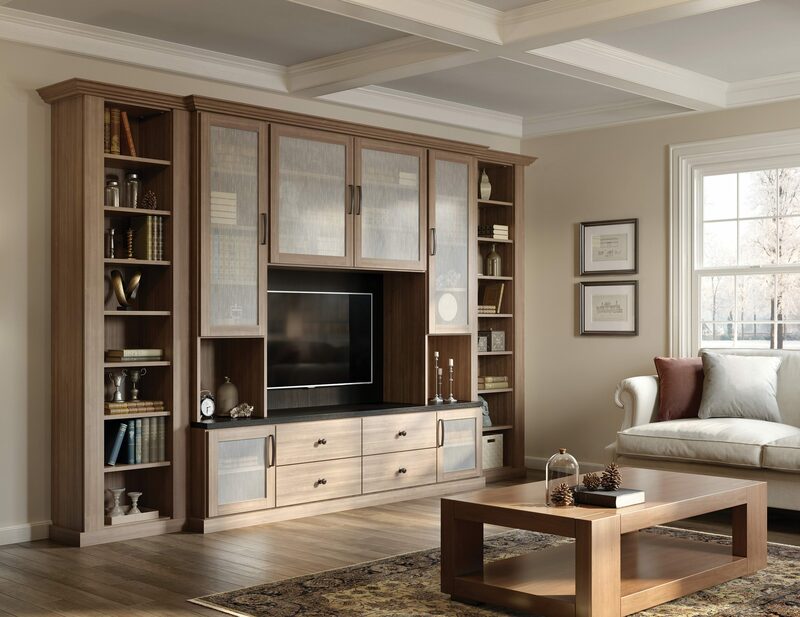 Traditional crown molding detail on entertainment cabinets creates that coveted built-in aesthetic. Bellissima White finish blends seamlessly into the room. Flip-up door mechanism allows for easy access. This multifunctional media center incorporates hidden hardware and sliding doors for a modern design statement. Tesoro™ Tuscan Moon and Lago® Venetian Wenge finish create a high-contrast look. 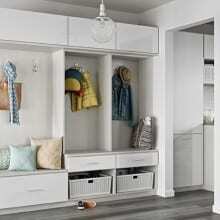 Sliding doors optimize available cabinet space. 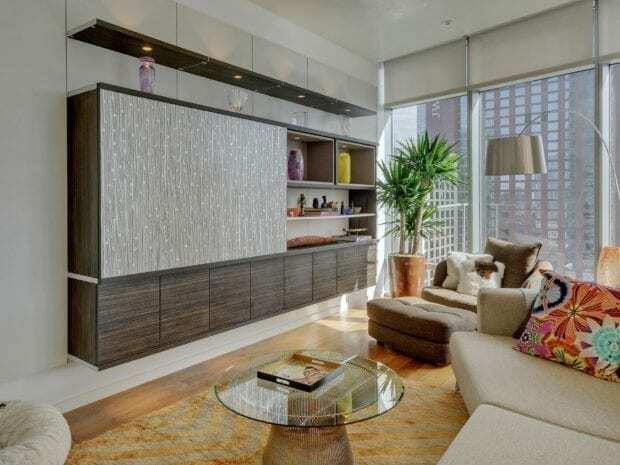 Aluminum frames with Celsius Bronze glass provide concealed storage. 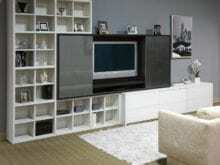 Entertainment storage provides an organized home for media. 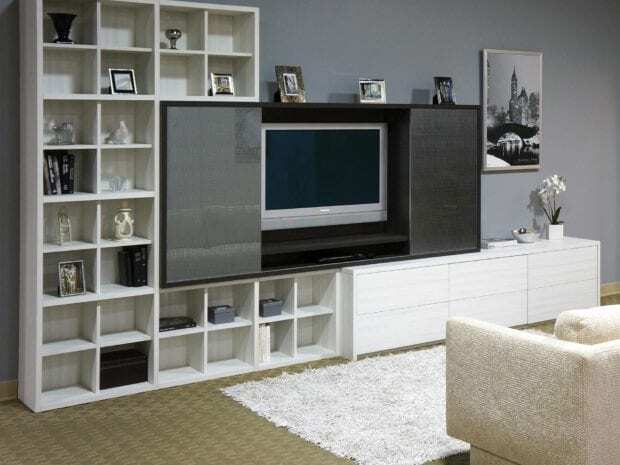 Technology component storage conceals wires and cables. Lago® Roman Walnut system lends a more transitional look. 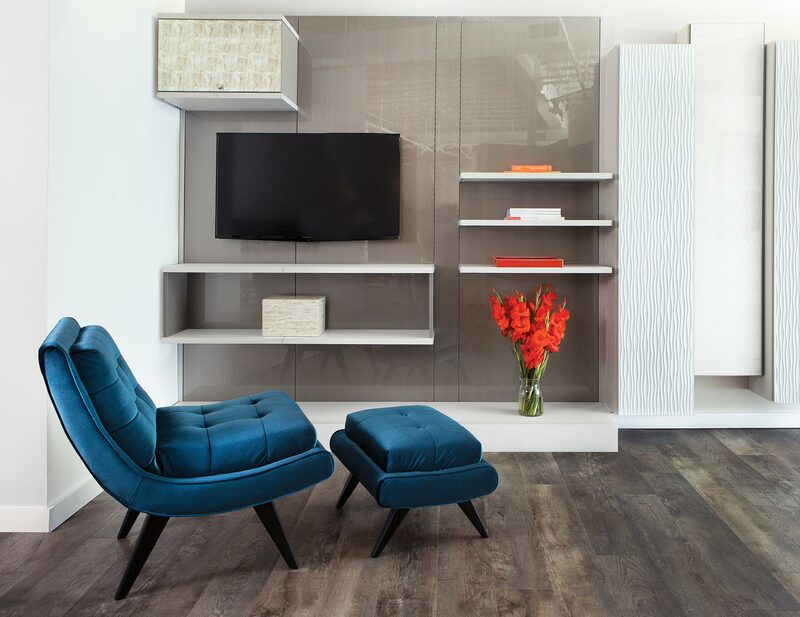 Floor-based system lends a furniture-like look. 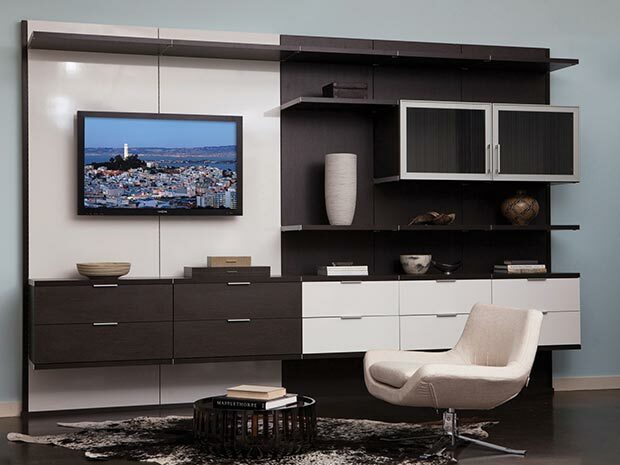 A striking design with contrasting finishes creates a dynamic and balanced entertainment center. 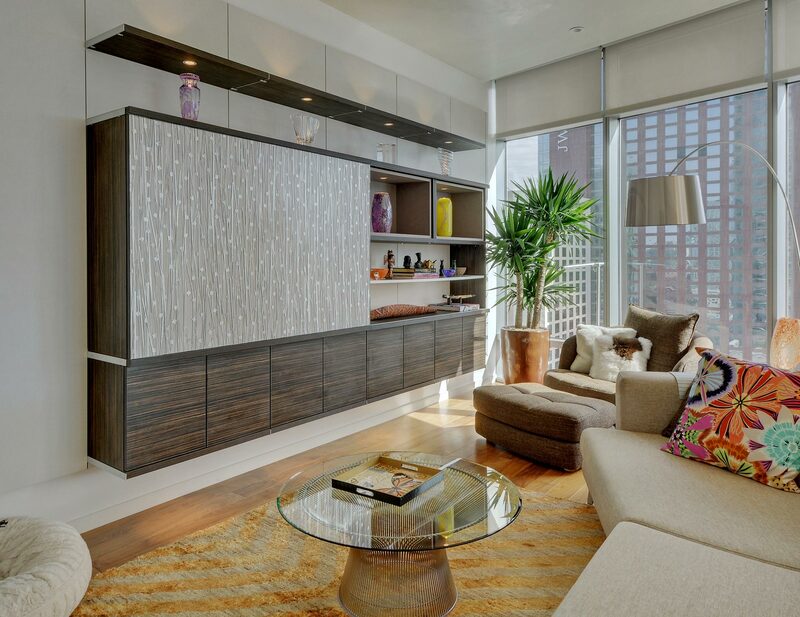 Venetian Wenge and High Gloss White finishes create a bold look. Slab front doors add to the contemporary appeal. 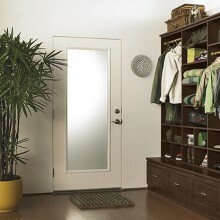 Aluminum door fronts with Cannes clear glass inserts offer additional fashionable storage. Matte aluminum finger pulls complete the style. 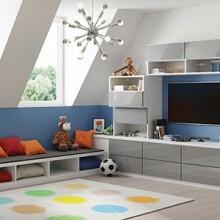 Open shelving provides a space to display collectables. 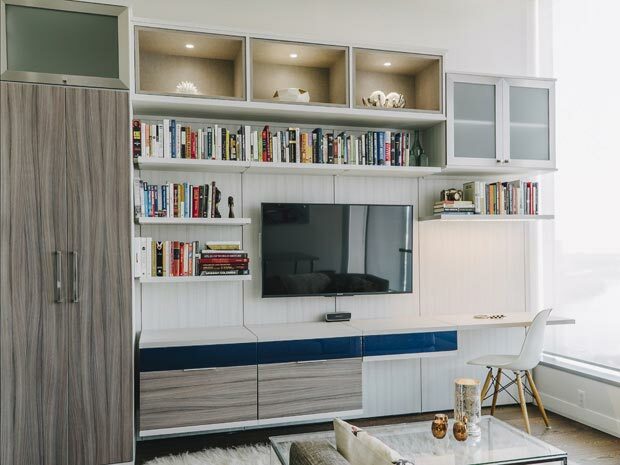 Floor to ceiling storage behind white slab doors make this entertainment center feel clean and sophisticated. Bellissima White finish adds a subtle texture to this elegant design. 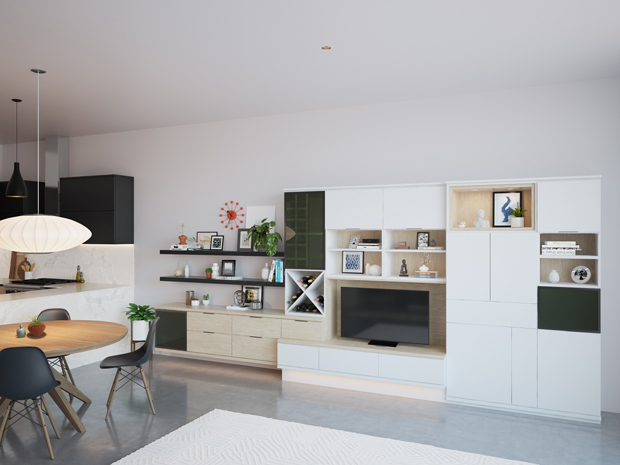 Slab doors with push to open fronts create a sleek, modern aesthetic. 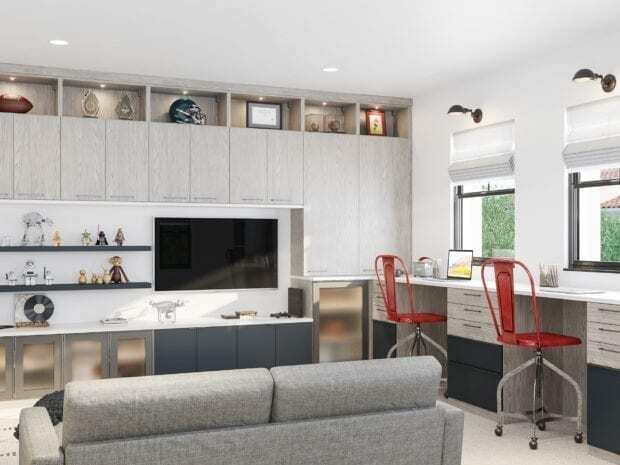 A toe kick on the bottom of the design makes the unit feel seamless with the rest of the room. 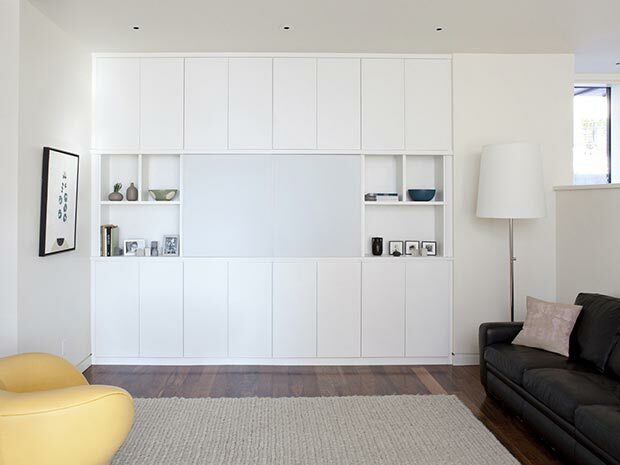 Sliding doors with white back painted glass inserts artfully offer concealed storage. 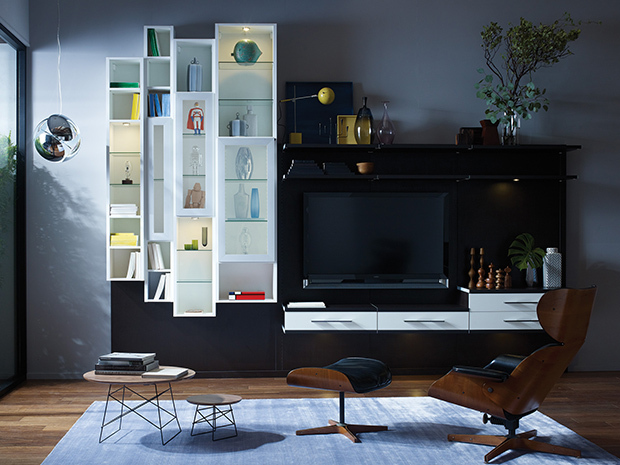 Open vertical shelving provides a space to display collectables.